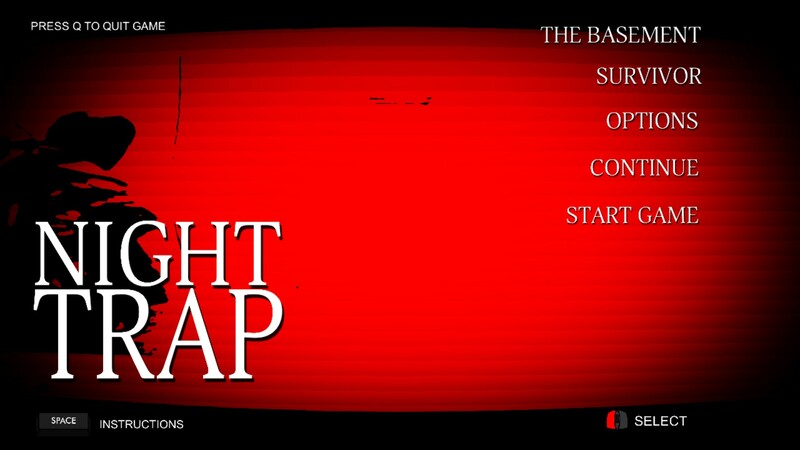 Ah, Night Trap. The bete noir of the anti videogame crusade in the early 1990s. The first Full Motion Video (FMV) game playable in the home (Yes, there had been versions of Dragons Lair, but these used graphics redrawn on the host machines, not the original FMV of the arcade version). Admittedly low res, grainy, makes a 5th generation VHS pirate copy look good FMV, but FMV nonetheless. 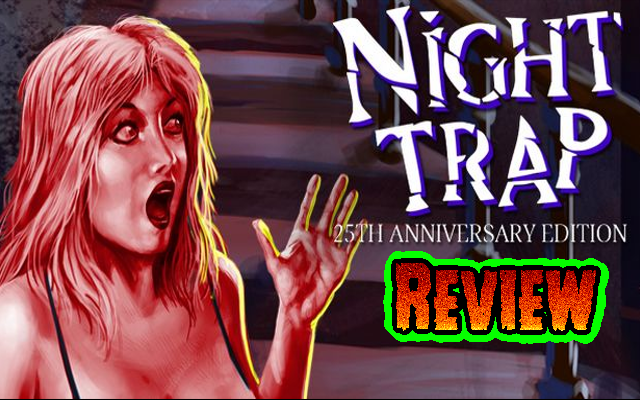 So, after gracing the Sega Mega CD back in 1992 (and the 32x, 3do, and PC in subsequent years), Night Trap is back. And this time it is in HD! Kinda. The game has a fairly straightforward plot: Teenagers have been going missing after visiting a remote cabin owned by the mysterious Martin family. The family are actually vampires, and are abducting teenagers to steal their blood and bottle it for themselves and the Augers. The Augers are a half-breed of vampire, unable to take blood naturally they need it extracting first. You play a member of an elite unit who have hacked in to the cabins unique video camera and trap based security system, and must protect the teens whilst trapping the Augers, and ultimately the Martins themselves. And that is it. You switch from room to room, aided by the beeping of the security system, trapping Augers and keeping the teens safe. Every so often the security system has its pass code changed, which you need to listen out for, because if you miss it you get locked out and could well fail to save a teen… which means game over. Now, back in the day, despite the low res nature of the video, this was a truly ground breaking game. As the player you were interacting with multiple, simultaneous video streams which offered unparalleled interactivity (even if you were just pressing 1 button to activate the traps. Each new version offered an improved interface, and better quality video without changing the way you played. 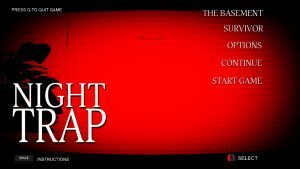 Eventually, Night Trap became the punchline when people referred to “interactive movies”, and how poor they were. Yet it remains fun to play. Yes, your interactivity is limited, but the hammy acting, and fun traps do make for an enjoyable experience. And you can always try and improve your run through by trapping more Augers (until you manage the perfect game and trap all of them). This is the ultimate version of the game. The footage has been rendered in the highest quality possible (not quite HD, but pretty damned close), and the UI has been given a nice new look, although the game also features an option to select the interfaces from 3 of the prior versions, using the new footage. And there are some nice extras, too. There are some deleted scenes, 2 documentaries about the title, a Theater mode so you can watch all the scenes in order, A “survivor mode” that challenges you to trap as many Augers as you can, and the unreleased prototype for Night Trap: Scene of The Crime. Many of these require unlocking through gameplay, further adding to the replayability of the title. The only real negative I can give is that outside of the US, you can only get the PC version, as the PS4 edition only ever released in the US despite the developer claiming that an EU release was “imminent”. 4.5/5 Fiends. Bloody good fun.